Virtual machines can use a large amount of disk space. If you want to regain some of that disk space, just deleting files inside the virtual machine won’t help. 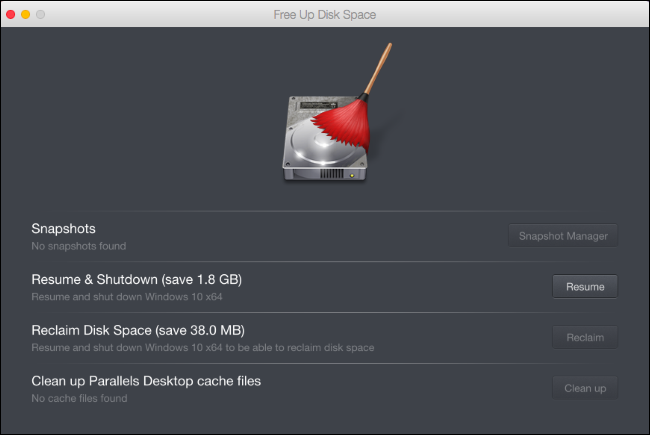 You’ll need to reclaim that disk space, shrinking the virtual hard disk and making it use less space on your Mac. Parallels includes a helpful wizard that will walk you through this. To open it, launch Parallels, select the virtual machine you want to free up space on, and click File > Free Up Disk Space. If you have multiple virtual machines you want to free up space from, you’ll need to repeat the below process for each virtual machine. Snapshots: If you’ve taken snapshots to save the state of the virtual machine, those snapshots will use space. Click the “Snapshot Manager” button and you can choose to delete some snapshots to free up space. Resume & Shutdown: If you put the virtual machine to sleep instead of shutting it down, the contents of the virtual machine’s memory are saved to your Mac’s hard drive. If you resume the virtual machine by clicking the “Resume” button and then select “Shut Down”, these files will be deleted. This is just a temporary fix, however—if you restart the virtual machine in the future and then put it back to sleep instead of shutting down, those resume files will be recreated. But these files will be erased whenever you shut down the virtual machine. Reclaim Disk Space: Virtual machines tend to expand over time as you add and delete files inside them. To shrink the virtual machine’s files on your Mac, click the “Reclaim” disk space button here. If it’s grayed out, you’ll need to click the “Resume” button and then shut down your virtual machine to continue. Clean up Parallels Desktop cache files: Parallels stores some cache files on your Mac, and you can click “Clean up” to delete the cache files associated with this particular virtual machine. If you need to compress the disk even further, try removing unnecessary files from it before using the “Reclaim” option in Parallels. For example, on a Windows virtual machine, you’ll want to boot it up and use the built-in Disk Cleanup tool to clean system files. You may also want to uninstall programs you don’t use, empty the recycle bin, and follow the usual tips for freeing up space on a Windows PC. After performing this process, shut down your PC and return to the Free Up Disk Space wizard. You should be able to reclaim a larger amount of disk space.